The Bulldogs topped the Ramblers thanks to nine strikeouts from Emily McKenney, who also allowed just two hits. MADISON — No, Madison didn’t score nine runs on Monday without hitting the ball out of the infield. It sure seemed like it, though. The Bulldogs have above-average team speed, and they used it to their full advantage. 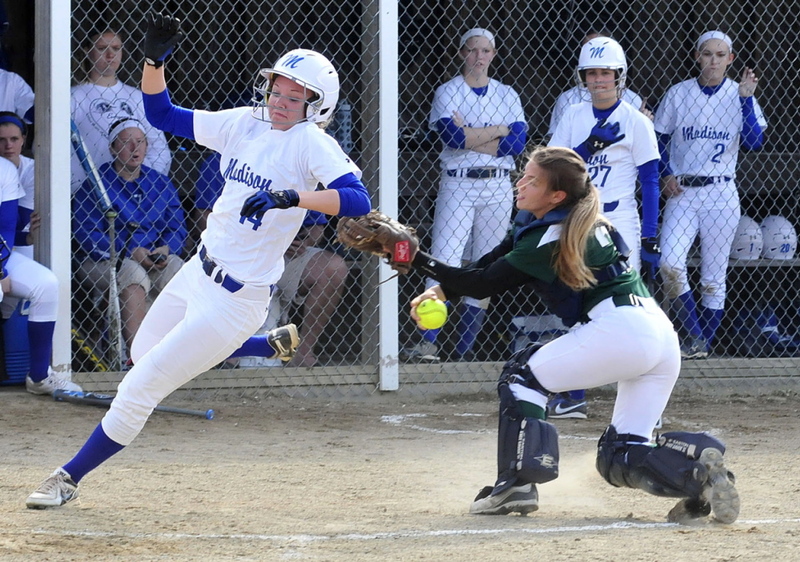 Madison had five infield hits, and nearly beat out several others. The Bulldogs added some line drives later in the game and took a 9-0 Mountain Valley Conference softball victory over Winthrop. Staff photo by David Leaming SAFE: Madison’s Cristie Vicneire, left, crosses home plate as Winthrop’s catcher Cat Ouellette tries to make the tag during a game Monday in Madison. The Bulldogs won 9-0. With an 8-4 record, Winthrop is one of the better teams in Western C. The Ramblers threatened against Madison ace Emily McKenney in the first inning, putting two on when Kaleigh Obert was hit by a pitch and Cat Ouellette singled through the left side. McKenney ended the inning with two strikeouts, and was her usual stingy self the rest of the way: Winthrop’s only baserunners over the final six innings were a second-inning single by Randi Dennett and a fifth-inning walk by Tessie Moody. McKenney finished with a two-hit shutout and nine strikeouts. Madison scored three runs in the bottom of the first, thanks to speed and great batting. Leadoff batter Kirsten Wood fell behind 0-2, but legged out an infield single on the ninth pitch of the at-bat. Kayla Bess beat out a bunt, with Wood going from first to third on the play. Aly LeBlanc and Alex Jarvais added RBI singles later in the inning. Jarvais’ single came after Hilary McKenney drew a walk after being down 0-2 in the count. “We knew that the pitcher was pretty good, so we’d have to get on any way we could, and advance the runners,” said Wood, who finished 4 for 4 with two runs scored and a pair of RBIs. In the second inning, Dennett was playing center field when she hurt her knee after a long run for a pop fly single by Wood. Dennett was carried off the field, and after Winthrop pitcher Krissy Doughty worked out of a bases-loaded, no-outs jam, things got a little scary between innings. Dennett lost consciousness on the bench, and the game was delayed 17 minutes while an ambulance arrived and took her away. Dennett later posted an “ambulance selfie” on Twitter and reported that nothing was broken, but she would need to wait a few days to find out whether anything was torn. Madison (12-1) plated two more runs in the third inning on a walk, an infield single by Erin Whalen, a bunt single by Madeline Wood, and Kirsten Wood’s two-run ground ball single over third base. The Bulldogs ended the scoring with four runs in the fifth. Bess was 3 for 3, while Whalen, Aly LeBlanc, and Madeline Wood each added two hits.